I originally posted this on one of my collaborative blogs “Who’s Who and Who’s New” last Winter, but I wanted to share it here in case you don’t follow that blog yet. At our school we do the DIBELs assessment for reading and the mClass Math assessments for math. Read on to see how I created some worksheets for my students to get practice all year for these assessments. So what are mClass math assessments? They are standardized tests given at the beginning, middle, and end of the year. It helps us decide what level students are on, and who may need to be put into math RTI. It is similar to DIBELS which is used to test literacy skills. In Kindergarten, the skills tested are counting, quantity discrimination, missing numbers, and number identification. The students have one minute to complete each activity with includes numbers 1-100. For many Kindergarteners, just learning the format of the tests and what is being asked of them, is just as important as actually taking the tests. I created a set of worksheets to help my students practice these skills throughout the year, so when assessment time rolls around, they’ll be ready to go! For each month, I have colored versions and black/white versions of the worksheets. Since my school counts our copies, I put the colored version into sheet protectors and use in my math centers or RTI Math small group. Students LOVE to use dry-erase markers and this makes them easy to clean and re-use. I put these worksheets front and back in the sheet protectors. One side includes numbers 1-10 and the other side is 11-20. You can find all of these activities in my “A Year of mClass Math” bundle. You’ll get 10 months worth of worksheets including color & b/w versions! If you want to try this before you buy it, grab a FREE sample of the product here! 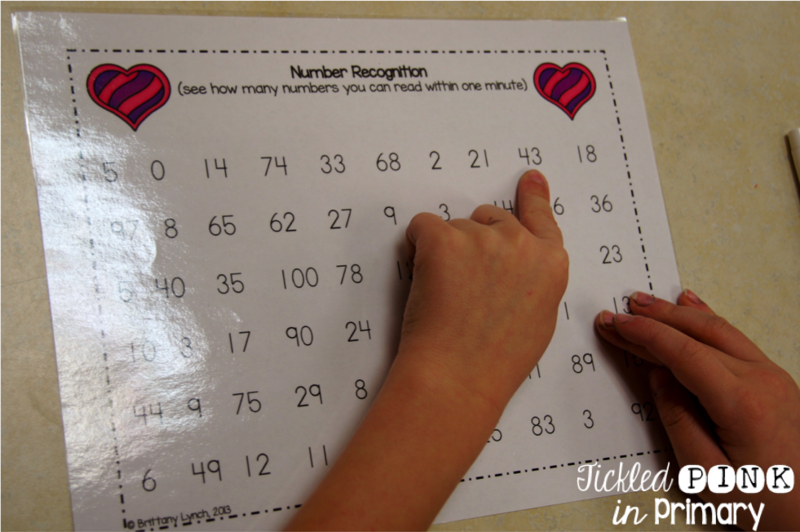 Another fun way to review missing numbers is with my Missing Numbers Fluency & Fitness game! I’ve mentioned this game before, but for you new followers, here’s how to play. You simply project one of the slideshows onto a big screen and flip through the slides as fast or slow as you think your students can do the skill. When they see an exercise slide, they have to do that exercise until you click to the next screen. I like to tease my students and stay on the exercise screen for a while. 😉 I have Fluency & Fitness available for many reading and math skills.